Abu Dhabi’s hotels are among the most lavish in the world, and, consequently, the most expensive. One hotel in particular stands out for just one of its many suites: the highest suspended suite in the world. 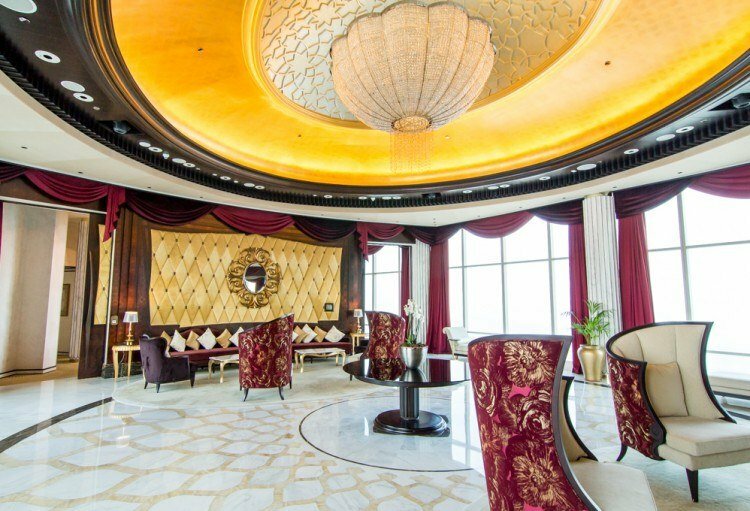 The top suite at the St. Regis Abu Dhabi hotel is one of the most expensive in the world, charging about $40,000 per night. And, as you may imagine, it is incredibly extravagant. It is also one of the most coveted suites, but only a few people can afford to spend a night there. The good news is that anyone can now visit and explore the suite for just a fraction of the price, thanks to the hotel’s new Brunch in the Cloud program. If you fancy spending a day inside the highest suite in the world, then read on to get a clue of what to expect. The experience will start with a graceful reception. Visitors will start their tour at the hotel’s grand reception hall, where they will be met by one of the hotel’s butlers. The butler will then lead them to the suite’s private elevator, which will carry them all the way to the top floor and into the world’s highest suspended suite. Once in the suite, the visitors will be met by another butler who will proceed to give them a comprehensive tour of the suite. The suite measures 1,120 square meters, and it has many rooms that include a spa, cinema room, dining room, living room, study, kitchen, and even two-storey Arabic lounges. Although the suite does have many rooms, the tour will focus mostly on only the main rooms. The first is the cinema room, which packs a sleek HDTV screen, an explosive music and entertainment system, and a plush luxurious environment. The visitors will also visit the oyster room, dedicated cheese and desert rooms, caviar ice bar, and roaming chef stations. The most appealing, without a doubt, will be the fully- equipped private bar. The highlight of the tour will be the suite’s décor. Ideally, the suite boasts some of the finest and most expensive décor to match its price and the class of its clients. The décor is characterized by aspects such as 24-carat gold leaf accents, cascading crystals, smooth and silky fabric, and an elegant blend of different made possible by the suite’s position in the clouds. The visit will not be limited to the visual appeal alone as the chefs have a buffet of tantalizing foods and drinks waiting for visitors in each room. The cinema room, being the sweetest, has bowls of sweet candy waiting for the visitors. There are also many foods to enjoy in the dedicated dessert room, and the cheese room stores some of the finest cheese in the world. And, if you were wondering, the caviar ice bar and private bar are also open for use and visitors can enjoy some of the best cocktails made by the best mixologists in the hotel and the city. It will take some time to cover all 1,120square meters of the suite. It will also take longer to taste each of the delicacies set out by the chefs. To this end, the visitors will be entitled to at least one break, and they will be free to make the most of the suite’s luxuries to pamper their bodies. Guests will be free to visit the suite’s private spa where they can enjoy massages and manicures. Shoulder massages will be offered by therapists for the hotel’s Remede Spa while manicures will be offered by the hotel’s Sisters Beauty Lounge. The therapists are professionals and run successful spas in the main hotel, so visitors can expect quality services. The world’s highest suspended suite has always been a reserve for the rich and opulent, so it came as a surprise for many when the St. Regis Abu Dhabi announced the Brunch in the Clouds program. However, as it turns out, the beauty and elegance of the suite has always been a public admiration, and the hotel wishes to indulge the public. Brunch in the Clouds takes place on every last Friday of every month and it takes on a maximum of 50 guests only. Considering the high demand for the tour, spots are often booked weeks or months before the scheduled dates. However, it is important to note that tours are closed on every June due to the Ramadan celebrations. What’s more, it is not certain whether the tour is a permanent program or a momentary treat for the hotel’s customers. As such, any plans to be a part of the tour should be made early unless you have $40,000 to spend for a night’s accommodation. Fortunately, the price you have to pay for a visit to the world’s highest hanging suite is fair, if not cheap considering the standard accommodation cost. Although the price is not fixed, the hotel starts the figure off at 400AED, but this may increase or decrease depending on demand and other factors. As you may imagine, the affordable pricing only serves to boost demand. Placing a reservation for a spot on the Brunch in the Clouds tour is incredibly easy and fast, but it is not always successful as spots are always full. The easiest way to make a reservation is by sending an email to the hotel’s official email address: [email protected] You can also visit the hotel at Nation Tower, Cornice in Abu Dhabi.